This year, I'm teaching two courses for the first time. These courses are physical science and math concepts, a class for 9th graders who are not yet ready for Algebra 1. These new-to-me classes are stretching me and my teaching in a very cool way. I'm being exposed to new teaching techniques, and I'm able to take these ideas and apply them to my other classes as well. 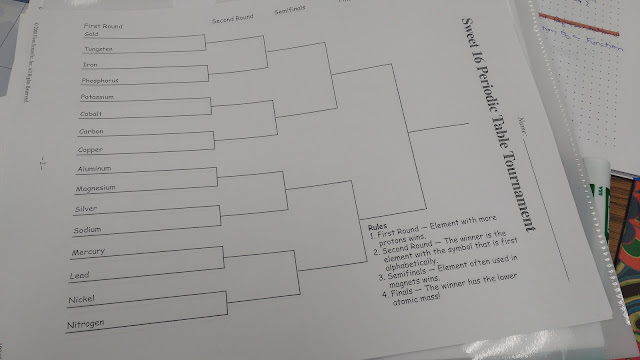 While looking for resources to help my physical science students learn about the periodic table, I found a "Sweet 16 Periodic Table Tournament" online from Flinn Scientific. Students are given a tournament bracket with 16 different elements. For the first round, the element that has the most protons wins. For the second round, the element whose symbol comes first alphabetically wins. For the third round, the element which is used most often in magnets wins. Finally, for the fourth round, the element that has the lowest atomic mass wins. This was the perfect activity to get my students to become more familiar with the periodic table. Now, I'm thinking about ways to adapt this practice structure to my math classes. I can also see possibilities with linear graphs (slope, y-intercept, x-intercept). Can you see this idea being used in math class? Leave a comment below! Are all the student pages the same?